It’s an interesting thing having a chronic disease. I have Parkinson’s Disease, was diagnosed back in 2009. I had never known women could even get Parkinson’s, and thought it was something much older people got. I mis-interpreted my symptoms for awhile, attributing them to a botched (in my personal opinion) bunion surgery which left me with leg and foot issues. There were other signs but I didn’t know that they were all part of the same issue. But, I remember being at my son’s lacrosse game, and trying to clap. I couldn’t get my two hands to clap together; my left hand just wouldn’t cooperate. It was time to see a doctor. The medicine I was given was, to me, a godsend. Although my neurologist told me to give it a month or so to work, I saw a change within days of starting it. Of course, over time, my body has needed occasional increases or changes in meds, but basically I seem normal. I don’t tell everyone that I have this disease. I thought I would, but quickly realized that some people see nothing but the disease once they’re told. So I have been able to choose who and when I tell people. Being able to decide who and when to tell is a luxury given to me by the medications. I’ve told people who have said that they never would have known, that I looked and seemed “normal”. Probably only my husband, my doctor and my PD friends realize that the medicines just mask my problems. I can tell when its time to take my meds by listening to my body before I actually see a clock. One of the best ways to fight back when you have Parkinson’s Disease is through exercise. My husband and I prioritize this as almost my main job. I use a local gym, go to water exercise classes and am taking tai chi. I feel better when I exercise, it keeps me strong and prevents my joints for locking up. The water classes and tai chi are both sponsored by a local PD association, meaning I have gotten to meet and get to know other folks facing the same challenge. There are as many women as men and it has enriched my life to know them. I’ve also gotten to “know” bloggers, both affected and caregivers, who have shared their experiences and allowed me to get to know my disease and its progression in various ways. I love to laugh and these are the people I can crack jokes with about the disease. I mean, there are positives. Studies show chocolate can help with symptoms, and also coffee. I am just waiting for them to discover that red wine does, too, although we already know it’s just generally good for the heart. . I hear they might add PD to the list of diseases which qualify for medical marijuana. Now if they could find a positive benefit from tobacco and Bailey’s Irish Cream. I’d love to take up smoking and to justify the cost of Bailey’s. Like other people with chronic diseases, I have had to find a way to deal with what lies in my future. I have a pretty wonderful life at this point so I don’t want to spend this good time worrying about when that will end. I don’t want my family to be sad or abnormal around me so I don’t talk about it unless they ask. 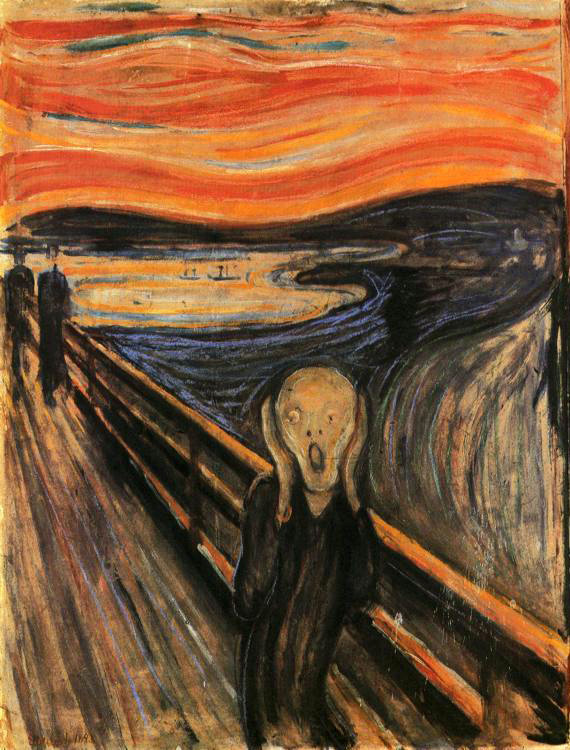 I think of myself sometimes as screaming inside (think of the Edvard Munch painting, “The Scream” here), even as I go about my day. It’s my alter ego of a sort. If I stop and contemplate what advanced PD looks like, that would be me. But there’s a lot of life left in between and I’m not ready to give up. With my husband’s support, my doctor’s expertise, good medicines, and great friends, I’m back to clapping with both hands. Categories: Parkinson's Disease | Tags: Parkinson's Disease | Permalink.